As you know, there’s always something new to keep up with when it comes to managing your business presence on Facebook. In this week’s issue of The Social Scoop, for our #1 featured article, I’ve rounded up not one but FIVE Facebook-related articles pertaining to recent changes as well as suggestions for improving your results. In fact, my blog post title here is a smidge mis-leading because the five featured articles actually include 6 Facebook updates, 23 example fan Pages and over 44 hot Facebook marketing tips! Woohoo! The blog version of this week’s edition of THE SOCIAL SCOOP weekly newsletter follows below! If you’re already subscribed, you’ll continue to receive The Social Scoop via email on Friday mornings. If you’re not yet signed up and would like to be, please enter your name and email in the box to the right (desktop) or below the post (mobile). Thank you! Excellent post by my Irish friend, Jenny Brennan; you’ll find plenty ideas here for your 2015 Facebook content marketing plan. 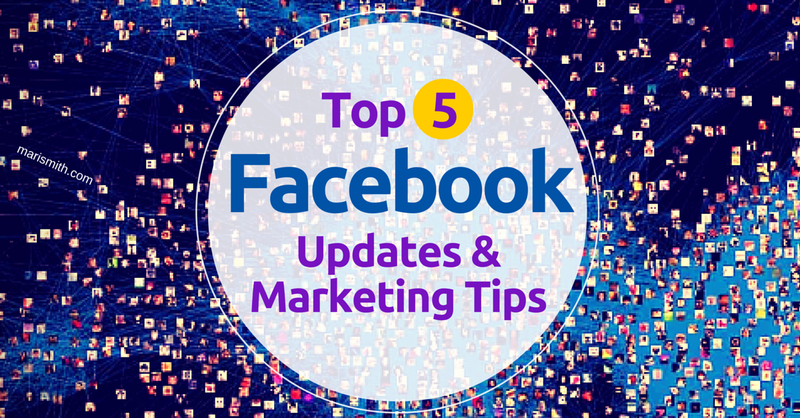 3) 6 Facebook Updates That are Great for Businesses! Several of these changes may be new to you. If you don’t have some of the new features yet, they’ll be rolling out soon to more Pages and countries. Kudos to my friends at ShortStack for this great overview. Wonderful roundup of useful suggestions by industry pros such as Michael Stelzner, CEO of Social Media Examiner; Ted Rubin, Brian Carter + HootSuite. Social analytics company, AgoraPulse, did a great job of reviewing 23 fabulous fan Pages that we can all learn from. This is the mother lode and one you’ll want to bookmark. We could all use a little help with getting our blog posts to catch fire and reach a wider audience! Many folks strive to ramp up their productivity at the beginning of the year. Make sure you’re allowing for plenty self-care time, too! This article has some good tips to help you stay on track. That’s a wrap for for this week’s issue of The Social Scoop! I hope you have a wonderful weekend and peaceful week ahead. Happy Martin Luther King day to one and all (Monday, January 19th). If you have not yet had a chance to see the beautiful movie SELMA, go for it as soon as you can! I loved every second of this poignant film. P.S. Will I see you in California on March 25th to 27th? I sure hope so. Come attend the world’s largest and most awesome social media conference LIVE and in person here in gorgeous, sunny San Diego! Click here to find out more about Social Media Marketing World and get your ticket ($380 savings!). JOIN over 97,000 beautiful peeps! 🙂 Each week, we sort through the huge pile of new social media blog posts, resources, articles, tools, tips and more … and Mari hand picks just three of them to send you via email. Enter your name and email below to start receiving our weekly top selections in The Social Scoop email newsletter, published every Friday. Got comments, questions, ideas? Feel free to let us know your feedback in the comments below. I always love to hear from my peeps.